1. NO PURCHASE NECESSARY. PURCHASE DOES NOT IMPROVE CHANCES OF WINNING. Void in Quebec and where prohibited by law. By participating in this sweepstakes, participant agrees to these Official Rules. 2. 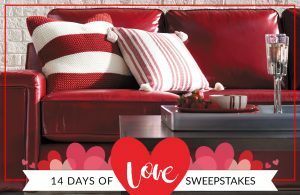 Sweepstakes Period: The La-Z-Boy 14 Days of Love Sweepstakes (the “Sweepstakes”) begins February 1, 2019 at 12:00 a.m. Eastern Time (“ET”) and ends February 13, 2019 at 11:59 p.m. ET (the “Sweepstakes Period”). 3. Eligibility: Open to legal residents of the 50 United States, the District of Columbia and Canada (excluding Quebec) who are at least 18 years of age or older at time of entry (or in the case of legal residents of jurisdictions where the age of majority is greater than 18 years of age, such age of majority under the laws of the jurisdiction in which they reside at the time of entry). Employees, officers, and directors of La-Z-Boy Incorporated (the “Sponsor”), and each of its subsidiaries and affiliated companies (and their respective IRS dependents, immediate family members [spouse, parents, children, siblings] and individuals residing in the same household [whether or not related] of such employees, officers, and directors) are not eligible to participate or win. 4. How to Enter: Visit http://info.la-z-boy.com/14DaysOfLoveEntry (the “Page”), during the Sweepstakes Period, and follow the online instructions to enter. Participation is subject to disqualification of all entries if multiple accounts are used by the same person. Limit: Each participant may enter once per day during the Sweepstakes Period. For purposes of this Sweepstakes, a “day” is defined as a 24-hour period, beginning at 12:00 a.m. ET and ending at 11:59 p.m. ET. All entries must be completed and submitted by 11:59 p.m. ET on February 13, 2019, to be eligible. Normal Internet access and usage charges imposed by entrants’ online service will apply. 5. Grand Prize Random Drawing: One (1) Grand Prize Winner will be selected in a random drawing on or about February 14, 2019, from among all eligible entries received during the Sweepstakes Period. The random drawing will be conducted by a representative of the Sponsor, whose decisions are final on all matters relating to the Sweepstakes. The odds of winning the Grand Prize will depend on the number of eligible Sweepstakes entries received during the Sweepstakes Period. 6. Prize and Approximate Retail Value (the “ARV”): Grand Prize (1): One (1) La-Z-Boy loveseat of the Grand Prize Winner’s choice, not to exceed an approximate retail value of $2,000 U.S. Dollars. Other costs associated with the product purchase, including, but not limited to, sales and other taxes, insurance, duties, delivery fees, any travel and transportation costs associated with redeeming the prize, if applicable, are solely the responsibility of the Grand Prize Winner. If Grand Prize Winner cannot accept a prize as stated, prize will be forfeited in its entirety and awarded to an alternate winner. Total maximum ARV of all prizes is $2,000 U.S. Dollars. 7. General Rules: Prize is nontransferable and no substitution is allowed except by the Sponsor, who reserves the right to award a prize of equal or greater value. Grand Prize Winner will be required to execute and return an affidavit of eligibility (or Declaration of Compliance if Canadian winner), liability/publicity release (where legal) within seven (7) days of notification attempt or prize will be forfeited and an alternate winner will be selected. Affidavit or Declaration package will be sent via email. If winner is a Canadian resident, he/she must answer unaided a time-limited arithmetic skill-testing question as a condition to receiving the prize. Winner and all entrants, as a condition of entry into the Sweepstakes, agree to release and hold harmless Sponsor and its subsidiaries, affiliates, officers, directors, shareholders, members, employees, agents, assigns, and all others associated with the development and execution of the Sweepstakes (collectively the “Released Parties”) from and against any and all liability, claims or actions of any kind whatsoever for injuries, damages, or losses to persons or property which may be sustained in connection with submitting an entry or otherwise participating in any aspect of the Sweepstakes, the receipt, ownership or use of prize awarded or any typographical or other error in these Official Rules or the announcement or offering of the prize. Winner assumes all liability for any injury or damage caused, or claimed to be caused by participation in the Sweepstakes or use or redemption of the prize. Acceptance of prize constitutes permission to use winner’s name and likeness for promotional purposes, without further compensation, except where prohibited by law. By entering, entrant accepts and agrees to be bound by these Official Rules. Entries will be declared to be made by the authorized account holder of the e-mail address submitted at the time of entry (or when setting up winner’s account). “Authorized account holder” of an e-mail address is defined as the natural person who is assigned to an e-mail address by an Internet Access provider, Online Service provider, or other organization (e.g., business, educational institution etc.) that is responsible for assigning e-mail addresses for the domain associated with the submitted e-mail address. Sponsor reserves the right at its sole discretion to disqualify any individual that tampers or attempts to tamper with the entry process or the operation of the Sweepstakes; violates the Official Rules; acts in an unsportsmanlike or disruptive manner; or acts with intent to annoy, abuse, threaten or harass any other person. The Released Parties are not responsible for technical, hardware or software malfunctions, telephone failures of any kind, lost or unavailable network connections, or failed, incorrect, inaccurate, incomplete, garbled or delayed electronic communications, whether caused by the sender, by any of the equipment or programming associated with or utilized in the Sweepstakes which may limit the ability to participate, or by any human error which may occur in the processing of the entries in the Sweepstakes. Entries generated by script or bot are not eligible. Sponsor reserves the right to cancel, terminate or modify the Sweepstakes if it cannot be completed as planned for any reason, including but not limited to infection by computer virus, bugs, tampering, unauthorized intervention, technical failures or corruption of any sort. In such event, Sponsor will award the prize in a random drawing from eligible entries received prior to cancellation. Void where prohibited by law and subject to all federal, state and local laws. As a condition of entering the Sweepstakes, Entrant agrees that: 1) under no circumstance will entrant be permitted to obtain awards for, and participant hereby waives all rights to claim, punitive, incidental, consequential or any other damages, other than for out-of-pocket expenses; 2) all causes of action arising out of or connected with the Sweepstakes, or prize awarded, shall be resolved individually, without resort to any form of class action; and 3) any and all claims, judgments, and award shall be limited to actual out-of-pocket costs incurred, but in no event will entrant be entitled to receive attorneys’ fees or other legal costs. 9. Winner: For the name of the winner, available after February 14, 2019, send a self-addressed stamped envelope by August 15, 2019 to: La-Z-Boy 14 Days of Love Sweepstakes Winner, La-Z-Boy Incorporated, One La-Z-Boy Drive, Monroe, MI 48162 USA.